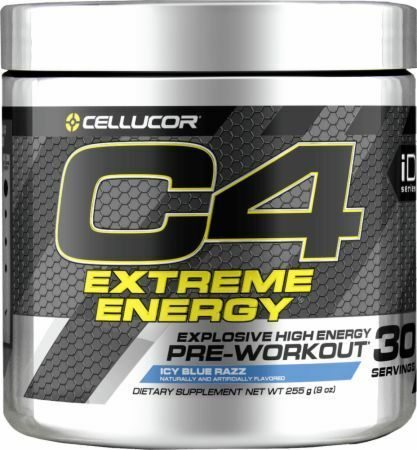 Take one serving (1 level scoop) of C4® Extreme Energy, mixed with 6-8 fl. oz. of water 20-30 minutes before training. Some individuals may experience a harmless tingling sensation, which is attributable to Beta-Alanine. USE ONLY AS DIRECTED. Citric Acid, Silicon Dioxide, Calcium Silicate, Natural & Artificial Flavors, Sucralose, Acesulfame Potassium, FD&C Blue #1. Natural And Artificial Flavor, Citric Acid, Silicon Dioxide, Acesulfame Potassium, Sucralose, FD&C Yellow #5. Silicon Dioxide, Citric Acid, Natural & Artificial Flavors, Polydextrose, Calcium Silicate, Acesulfame Potassium, Sucralose, Potassium Citrate, FD&C Red #40. Natural And Artificial Flavor, Citric Acid, Malic Acid, Silicon Dioxide, Acesulfame Potassium, Sucralose, FD&C Red #40. 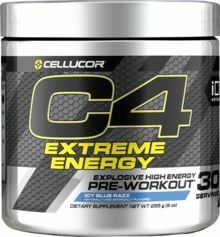 Natural And Artificial Flavors, Malic Acid, Citric Acid, Silicon Dioxide, Acesulfame Potassium, Sucralose, FD&C Blue #1.